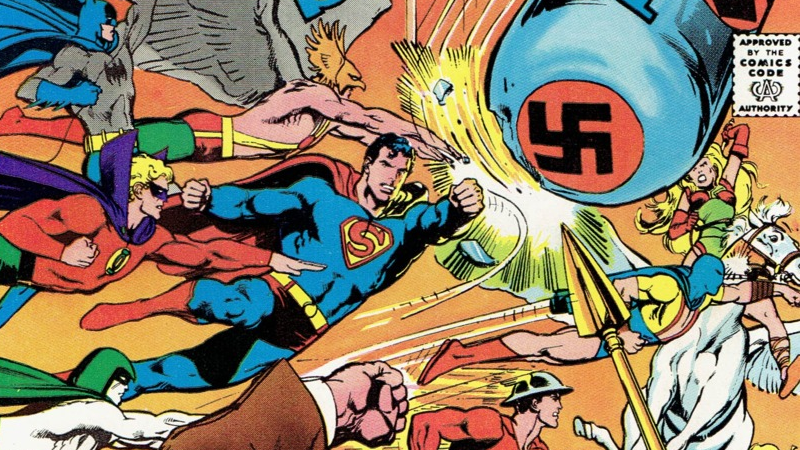 Superhero comics’ earliest rise to prominence occurred at the height of World War II—so it’s no surprise that the Nazi party became fodder for all sorts of spandex-clad superheroes, from their early days all the way up to 2017. As a reminder, here’s a few of the most famous examples of fictional heroes rising up to tackle a very real evil. In the wake of this past weekend’s horrific white supremacist rally in Charlottesville, Virginia, people all over the world—except for, seemingly, Donald Trump—looked to condemn the resurgence of fascist and neo-Nazi ideology at an event that ultimately lead to the death of a counter-protester. Among them was comics writer Gail Simone, who established the hashtag #ComicsHatesNazis to serve as a reminder that superheroes and their creators have helped fight back against hateful ideologies for decades. There’s many, many examples out there, but here’s just a sampling of a few of the very best fascist-busting moments from some iconic comics heroes. From Fiorello La Guardia’s impassioned defense of Captain America creators Jack Kirby and Joe Simon from Nazi sympathisers, to America Chavez clocking Hitler himself in the pages of her new comic 76 years later, superheroes’ fight against the evils of Nazism is a long story, one that’s still going on today in 2017.